Many commercial ProAV installs are challenged with small rack space real estate, either due to physical limitations such as small closets and cabinets or having to share rack space with an existing IT location. In the past, many pieces of hardware were specialized to performing one or maybe two functions within a system, each occupying valuable rack space. Systems requiring 2 or 3 of these types of devices could face serious space issues in these limited rack space scenarios! 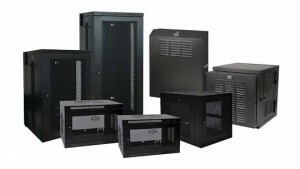 Rack design with proper air flow is now aided with new multi-function hardware designs such as Tripp Lite’s growing family of power distribution units (PDUs) that various choices and combinations of unmanaged IP signal gigabit switching and PoE into an efficient 1U rack cabinet. For example, Tripp Lite has introduced designs that are targeted for racks in smaller, distributed AV networks where space is at a premium. Their designs provide various combinations of AC power and PoE distribution with unmanaged Ethernet gigabit switching, all in only 1U of rack space. One particular PDU supplies continuous AC power from a connected UPS system (or alternate source) and contains (12) NEMA 5-15R outlets. The unmanaged gigabit Ethernet Network Switch on the other side of the 1U cabinet function has (24) RJ45 ports that support auto-negotiable 10/100/1000 Mbps and auto MDI/MDIX cross-over detection functions for true “plug and play” capability. Additionally, Tripp Lite has a model that includes 8 POE+ ports, which support up to 30W per port with a total POE budget of 120W, to connect POE devices such as Wireless APs, IP Cameras, VoIP phones and more. Utilizing Green Ethernet technology, power consumption is automatically lowered by turning off Ethernet ports not in use or and by detecting the connected network cable lengths to adjust the power usage to only what is necessary. As companies continue to find ways to maximize rack space, manufacturers are adapting to the challenges with products that have more functionality with 1U configurations. Based on the current trend, I would expect to see managed gigabit switching, IP-addressable AC outlets, surge & conditioning and the like. So on you next project, look for this combined functionality to implement into your rack design that utilize IP-based signal distribution.